Toys for Tots began in 1947, when Major Bill Hendricks, USCR and a group of Marine Reservists in Los Angeles collected and distributed 5,000 toys to needy children. The project was so successful that the Marine Corps adopted Toys for Tots in 1948 and expanded it into a nationwide campaign. Toys for tots aims to help less fortunate children throughout the United States experience the joy of Christmas, to unite all members of local communities in a common cause for three months each year during the annual toy collection and distribution campaign; and to contribute to better communities in the future. We will be collecting unopened toys from now until December 14th! 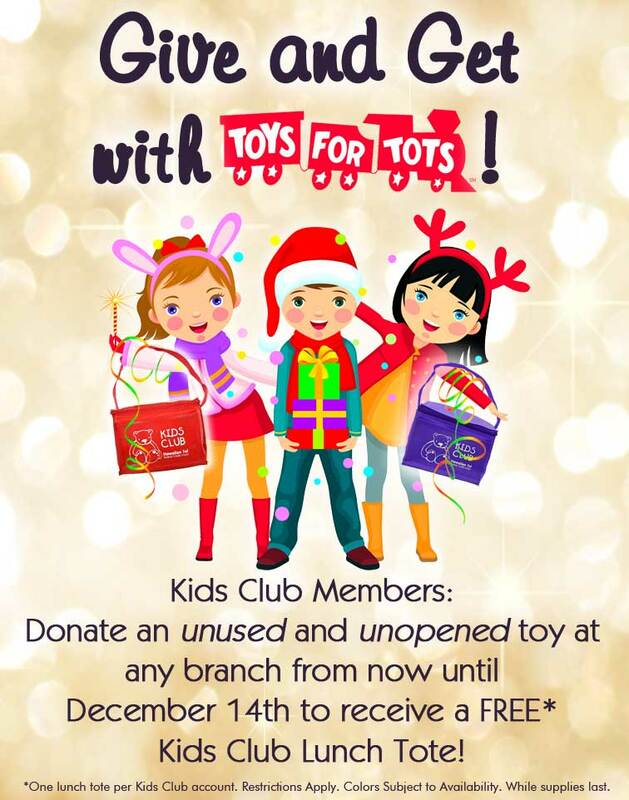 To show our keiki how fun giving can be, we are giving each Kids Club member who brings in a unused and unopened toy by December 14th a FREE* Kids Club lunch tote! Let’s all get into the holiday spirit by giving to Toys for Tots! This entry was posted in Kalakoa Musings and tagged christmas, community, gifts, givings, hitelfcu, holiday, kids, kids club, marine corps, marines, toys, toys for tots by Hawaiian Financial Federal Credit Union. Bookmark the permalink.